There is only one land reptile species native to Ireland, the viviparous or common lizard. Common lizards are widespread throughout the country but not very common. They are normally seen around coasts, cliffs, dunes, marsh and slob lands. 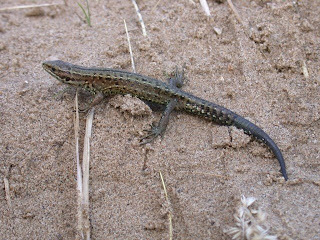 Common lizards are normally brown or yellowish in colour with black stripes running along the back. The length of the lizard's body is less than 12 cm (excluding the tail). The tail is 1.25 to 2 times longer than the body. The limbs are short, and the head is rather round. Males have more slender bodies than females. The neck and the tail are thick. The collar and other scales seem jagged. They love the sun and can often be seen basking on open bare ground or on a rock. When disturbed they run away and often it is the quick rustle as they disappear under cover that is the only sign of an encounter. The common lizard, unlike most other reptiles, does not lay eggs, but gives birth to live young that look like tiny replicas of their parents (hence the name viviparous). A litter can contain up to twelve young. Males reach maturity in their second year while the females take a year longer. The viviparous lizard feeds on invertebrates, mostly small insects. It shakes larger prey in its jaws before it chews it and swallows it whole. In Ireland viviparous lizards begin hibernation in September or October, underground or in log piles. Hibernation ends about mid-February. In southern Europe, the lizard does not need to hibernate. I spotted a common lizard a few months ago, when I was picnicking on the Wicklow mountains. Below is a video I took with my mobile phone. The quality isn't great but you can see how the lizard moves.